A spacious and elegant apartment on the middle floor of a Grade II listed Georgian house. 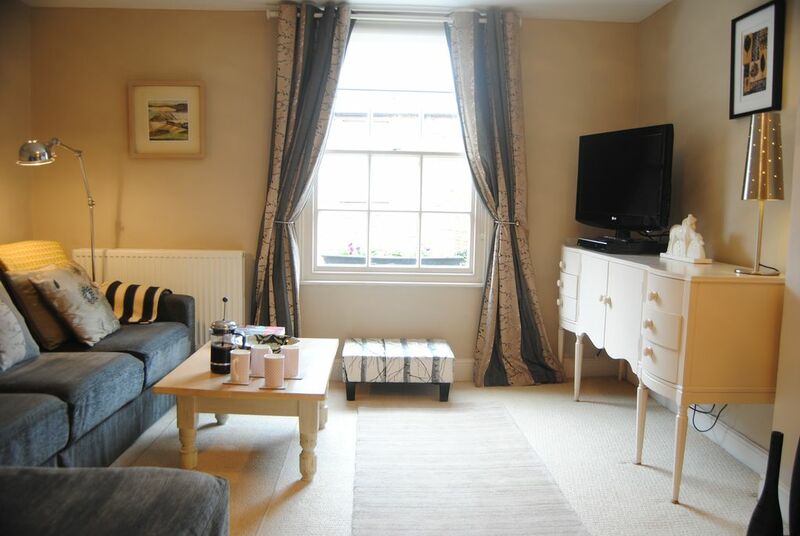 The apartment is minutes away from the Market Place; it is in a peaceful location and so handy for all that Uppingham has to offer: great restaurants, lots of independent retailers, antique shops and art galleries, all in a historic heritage setting. The apartment has its' own entrance, accessible through the passageway leading to the pretty courtyard. The two main bedrooms have ample storage - a walk-in wardrobe in the bedroom at the front and a fitted wardrobe in the bedroom at the back. The third bedroom is small but it has a window, small bedside table with drawers and is big enough for a single bed. We anticipate it will be especially suitable for a child who does not want to share a double bed with their sibling! The bathroom is half tiled and has a rainfall shower in the bath. Constant hot water is supplied by a new Combi boiler. We have a full kitchen with small pantry. It has a pine table and chairs, electric cooker, microwave, tall fridge freezer and full size dishwasher. Ample crockery and pans if you want to cook at home. Two nights minimum let. If you require the apartment for a longer period (eg waiting for a house purchase or a short-term working contract) please get in touch and we can discuss a discounted rate. Rutland is the smallest county in England with 53 villages and just two towns: Oakham and Uppingham. Uppingham is the smaller town, and many would argue that it is the prettier of the two. It's an ideal place to come to eat or to generally mooch about in the many independent shops & galleries. Bathroom: bath, rainwater type shower over bath. In the entrance hall downstairs there is a sink (useful for cleaning walking boots) and a washing machine. You can also keep cycles here too. Feather mattress topper on double bed in main bedroom and memory foam topper on second double bedroom.Duvets and extra cotton quilted coverlets as well as extra pillows if desired. Instructions on how to use in the apartment. There are washing lines outside but also a drying area in the hall. Washing tablets provided. We have a set of plates, bowls, cups & cutlery. We have a couple of oven-table serving dishes There are saucepans and frying pans We have a cafetiere & teapot. metal garden bench in courtyard and 2 additional garden chairs for guest's use. We stayed for 2 nights in this lovely apartment and were warmly welcomed by Sue and Dave. We were attending a wedding in Uppingham and the apartment was perfectly located for the church and venue. The apartment was extremely comfortable, well equipped and very relaxing. We also thoroughly enjoyed Sue's delicious tea loaf that was waiting for us upon our arrival. We would highly recommend this apartment. We had a lovely stay in the Uppingham apartment. Sue and Dave have put a lot of thought into making it comfortable and we had everything we needed. We would definitely stay again. Highly recommended. Great location within walking distance to the Market Square in Uppingham - we had lunch at Hambleton Hall and hired bikes the following day to cycle around Rutland Water. The apartment has all the equipment you need home from home. The beds are also very comfortable. Dave and Sue were a pleasure to deal with. Fabulous apartment - everything you could want for a weekend away, and more! Ideal location and Sue & Dave couldn't have been more helpful in the lead up to our stay and when we arrived. A lovely charming and cosy flat right on the High street (the quiet end) with a lovely little court yard. Clean, convenient and a personalized message and homemade cake upon arrival ! Highly recommendable! Wonderful break. Beautiful apartment which was excellent value. So glad you enjoyed your break in beautiful Uppingham. Thanks for your positive review and we would welcome your family back in future.